No matter which project it is that they are working on, electronics engineers must know exactly how the electrical circuits should be laid out and how they will work. Without printed circuit boards (PCBs), an electronics engineer’s job would be impossible. But, it can be quite a task for an electronics engineer to find the right PCB design software tools because they are so busy and there are so many to sift through. 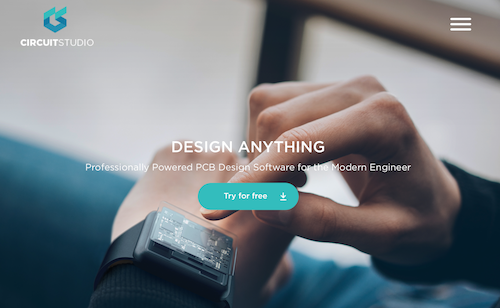 That’s why we have pulled together 46 of the top PCB design software tools for electronics engineers – to save you time while you are designing your projects. We also realize that one software tool may be appropriate for one PCB project while another will work better for other types of projects. As a result, we have included simple tools, free tools, and proprietary tools on our list. 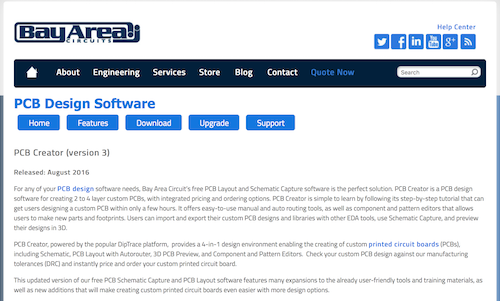 Our criteria was simple: the PCB design software tools for electronics engineers must be intuitive, include useful features, be established enough to limit risks, and feature a robust library so they can be applied to multiple projects. 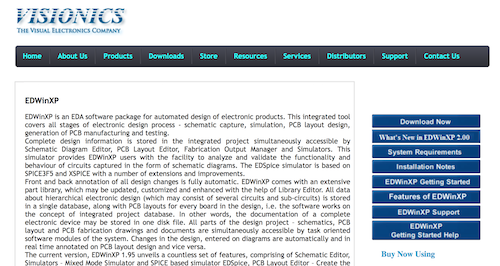 We share our top 46 PCB design software tools for electronics engineers here, in no particular order. Advanced Circuits is the leading PCB manufacturer with the industry’s largest active customer database and best on-time shipping record. 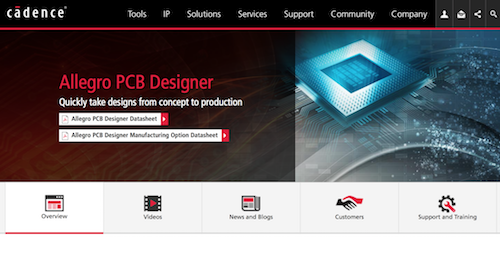 Their PCB Artist is a reliable software tool for electronics engineers looking for an intuitive, easy to use solution. Electronics engineers also choose PCB Artist because it helps save time and money. National Instruments accelerates engineering success with their open, software-centric platform that leverages modular hardware and an expansive ecosystem. Electronics engineers specifically choose National Instruments’ Utiliboard because it provides a rapid PCB prototyping environment for several applications. 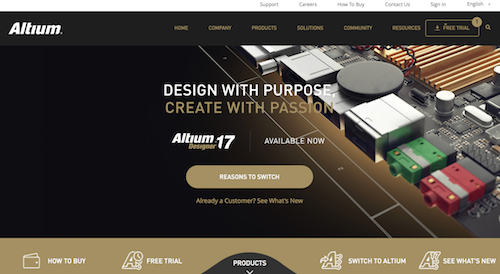 A software company providing PC-based electronics design software for engineers, Altium presents Designer 17. This PCB design software for electronics engineers is considered the gold standard by many in the industry. Altium Designer 17 is efficient, easy to use, and meets the modern needs of professional electronics engineers. For electronic design, SOLIDWORKS offers powerful design technology with on-demand bidirectional integration with SOLIDWORKS CAD. And, their PCB solution brings together CAD and PCB design for flawless collaboration. DipTrace is a PCB design software tool for electronics engineers that features an intuitive interface and wide capabilities. For PCB layout, DipTrace provides board design with smart manual routing and shape-based autorouter. Electronics engineers prefer DipTrace for its single environment with direct circuit-to-board converting, updating from schematic, and back annotation. 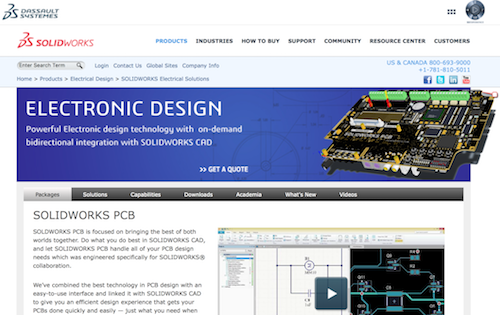 A full-featured electronics design tool, PCBWeb supports both schematics and PCB layout. 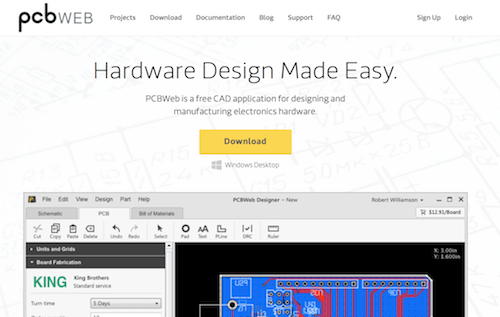 For electronics engineers looking to simplify hardware design, PCBWeb is an ideal tool for designing and manufacturing electronics hardware. BSch3V is a popular PCB design design software tool from Suigyodo Online for electronics engineers who need a free solution. 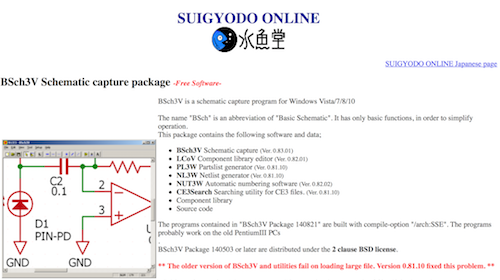 A schematic capture program, BSch3V is for Windows Vista/7/8/10 and has basic functions to simplify operations. Electrical engineer Tim Edwards writes and maintains XCircuit, a schematic capture program for presentations and an electronic design automation (EDA) tool. 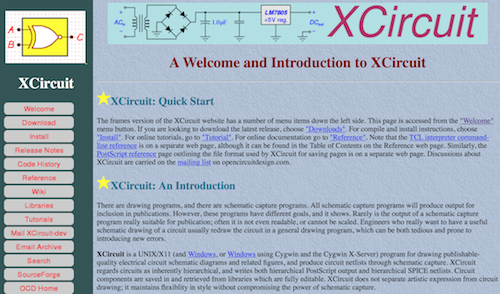 Electronics engineers make XCircuit part of their PCB design software toolbox when they need to draw publishable-quality electrical circuit schematic diagrams and related figures and produce circuit net lists through schematic capture. Available on sourceforge, gerbv is an open source Gerber file viewer for RS-274X only. Electronics engineers can load several files on top of one another with gerbv. 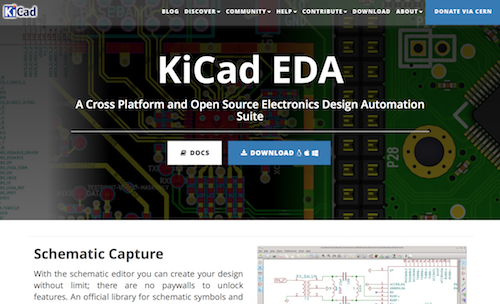 A cross platform and open source electronics design automation suite, KiCad EDA includes schematic capture, PCB layout, and a 3D viewer for electronics engineers. Create designs without limit, make professional PCB layouts, and inspect designs in an interactive canvas with KiCad EDA. 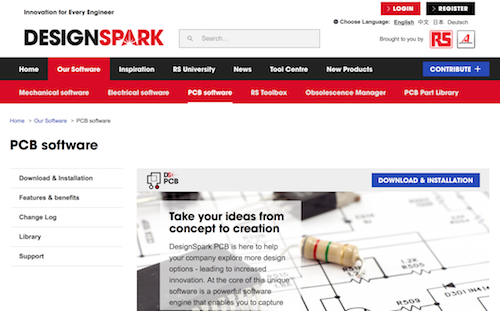 DesignSpark is for the engineering and maker community with free DesignSpark PCB, DesignSpark Mechanical, and DesignSpark Electrical software. Electronics engineers choose DesignSpark PCB when taking ideas from concept to creation is a priority. Offering 3D design, engineering, and entertainment software and services, Autodesk makes electronic engineers’ jobs easier with Eagle PCB. 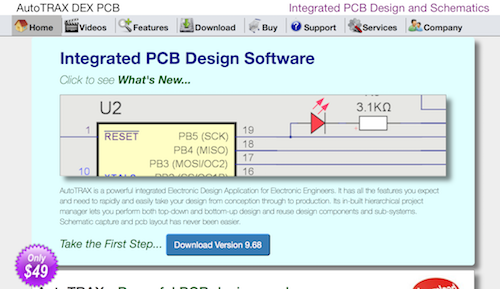 This powerful, easy-to-use PCB design software tool makes is possible for engineers to make anything they can dream. 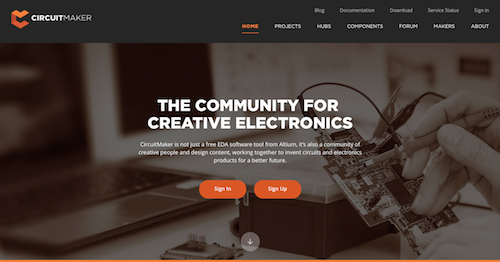 A free PCB design tool powered by Altium, CircuitMaker also includes a community of creative people that works together to invent circuits and electronics products. Electronics engineers looking to create products to better the future often use CircuitMaker to turn their idea into products. 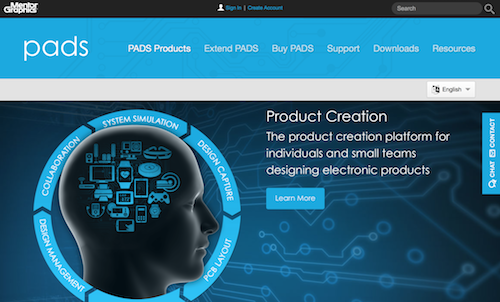 Pad2Pad is a printed circuit board manufacturer with free design software. 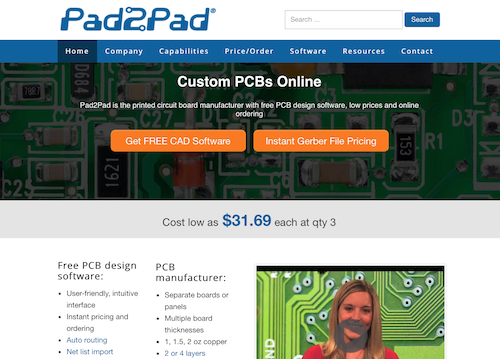 Electronics engineers use Pad2Pad to create products using a library of through hold components, net list import, any board shape, and auto routing. 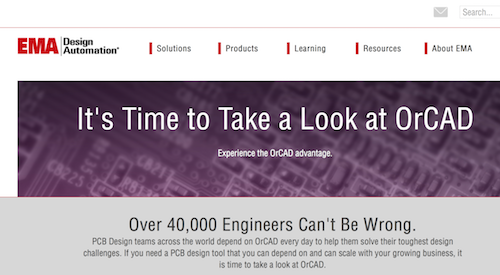 OrCAD is the PCB design software tool of choice for more than 40,000 engineers. Electronics engineers choose OrCAD because it is dependable and allows them to scale as business grows. They also prefer OrCAD because it provides a complete environment, from the initial schematic to the final artwork. 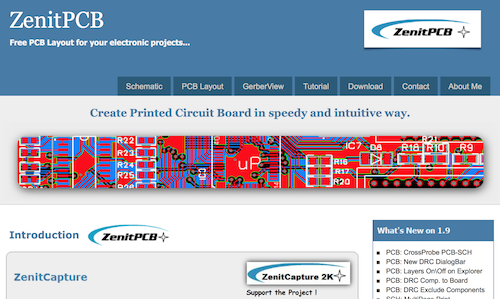 ZenitPCB is a free PCB layout software tool for electronic projects. A flexible and easy-to-use program, ZenitPCB helps electronics engineers create projects in a short time because it is intuitive. CircuitStudio is a professional PCB design tool for modern electronics engineers. 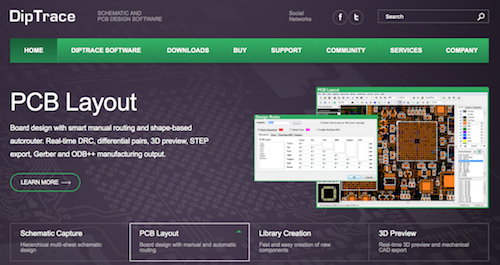 Use CircuitStudio to quickly design advanced PCB layouts with interactive routing, collaborate with mechanical design teams, and simulate and ship advanced electronics. Sunstone Circuits has been delivering high-quality, on-time PCB prototypes for more than 40 years. 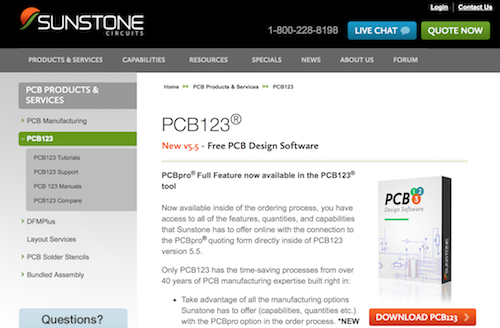 They also offer PCB123, a professional-quality PDB design software available free of charge for electronics engineers inside of the Sunstone ordering process. From ngspice, CUSPICE is available on CUDA platforms and supports hospice devices such as BSIM4v7, Capacitor, Self and Mutual Inductor, Current Source, Resistor, and Voltage Source. Electronics engineers speed up model evaluation, circuit, and right-hand side creation steps by up to three times with CUSPICE. 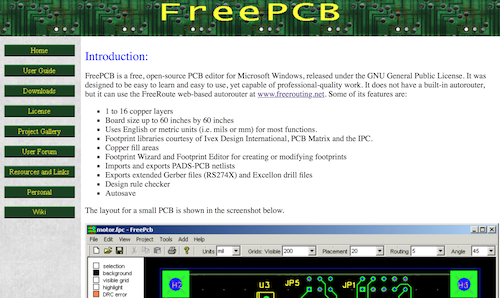 A free, open source PCB editor for Microsoft Windows, FreePCB is easy to learn and use but enables electronics engineers to produce professional-quality work. If necessary, engineers can use the FreeRout web-based autorouter with FreePCB as it does not include an autorouter. 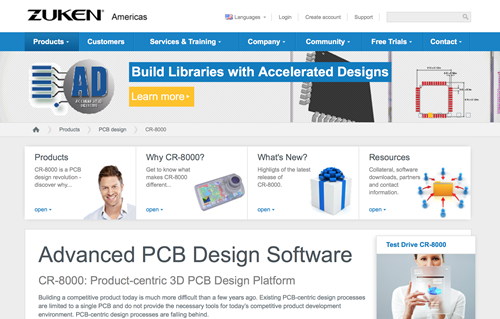 A leader in electronic design automation, Mentor Graphics PCB offers Xpedition, a PCB design software tool for electronics engineers. 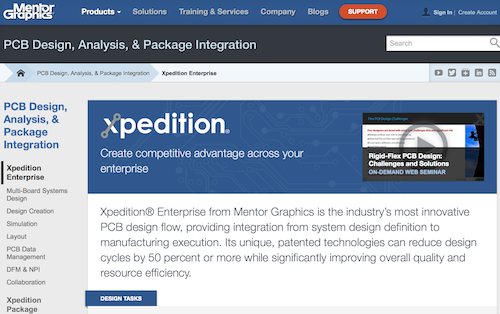 Billed as “the industry’s most innovative PCB design flow,” Xpedition includes unique, patented technologies to reduce design cycles by at least 50% while improving overall quality and resource efficiency. 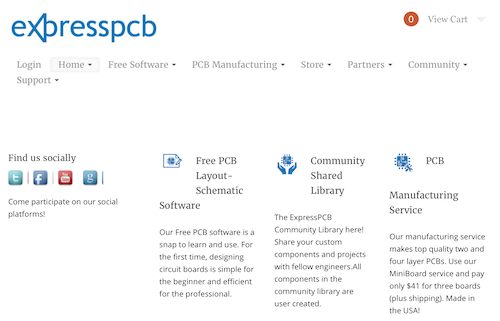 ExpressPCB is a PCB design software tool that is easy to learn. This free tool is appropriate for beginner and professional electronics engineers, who benefit from the ExpressPCB community library while completing designs. 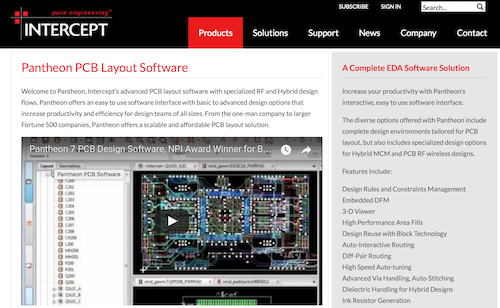 From Number One Systems, Easy-PC PCB is ready-to-use PCB design software for electronics engineers. Teams and individuals choose Easy-PC PCB because it is a professional design tool that is cost effective and scalable. 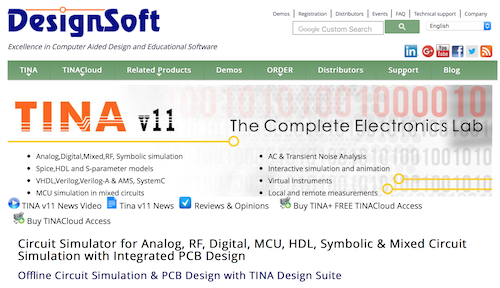 TINA (Toolkit for Interactive Network Analysis) Design Suite, a powerful circuit simulation and PCB design software package, is available both offline and online for electronics engineers. From DesignSoft, TINA is powerful, yet affordable and is useful for analyzing, designing, and real-time testing analog, digital, HDL, MCU, and mixed electronic circuits and their PCB layouts. A free software tool to support designs, artists, hobbyists, and engineers work creatively with interactive electronics, Fritzing is an open-source hardware initiative. Fritzing also includes a community website and services for processing and Arduino to foster a creative community for documenting prototypes, sharing with one another, teaching electronics, and laying out and manufacturing professional PCBs. 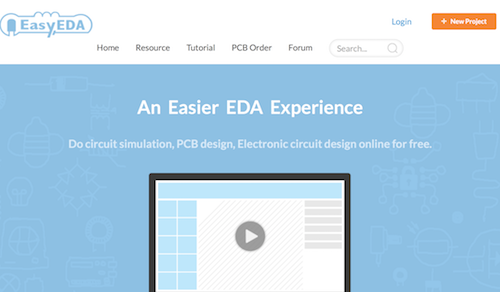 EasyEDA is a web-based EDA, schematic capture, spice circuit simulation, and PCB layout tool for electronics engineers. 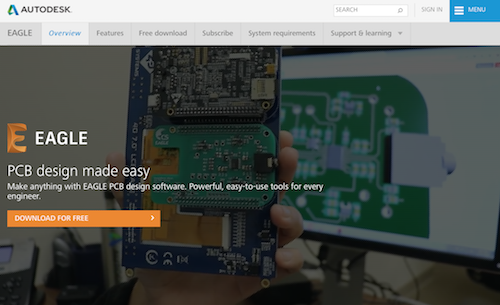 The developers of EasyEDA set out to create a PCB design software tool that provides comprehensive data and collaboration tools to help engineers and designers move from idea to product more easily and quickly. 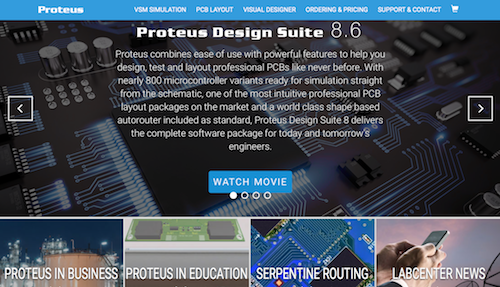 From Labcenter Electronics, Proteus combines powerful features with ease of use to help electronics engineers design, test, and lay out professional PCBs incredibly quickly and easily. Proteus is intuitive and includes a world-class shape-based autorouter, making it a complete software design tool for modern engineers. 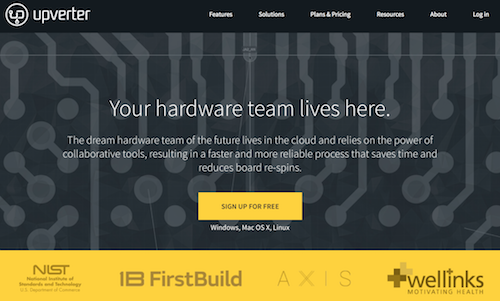 Upverter is a leader in cloud-based PCB design tools, and they attribute their success to empowering engineers by equipping them with world-class technology, knowledge, and support. With the power of collaborative tools, electronics engineers find a speedier design process that saves time and reduce board errors. 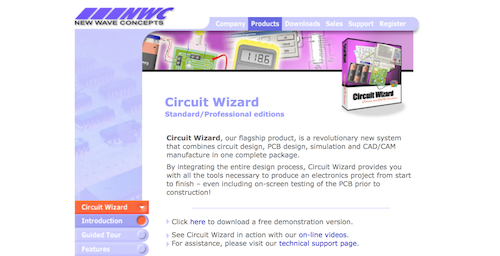 A PCB design software tool that combines circuit design, PCB design, simulation, and CAD/CAM manufacturing in one package, Circuit Wizard is available in educational, standard, and professional editions. The professional edition integrates the entire design process to give electronics engineers the tools necessary for producing a project from start to finish. Available on Sourceforge, TinyCAD is an open-source program for drawing electrical circuit diagrams, or schematic drawings. TinyCAD is a PCB design software tool of choice for electronics engineers who want a solution that supports standard and custom symbol libraries and supports PCB layout programs with several netlist formats. 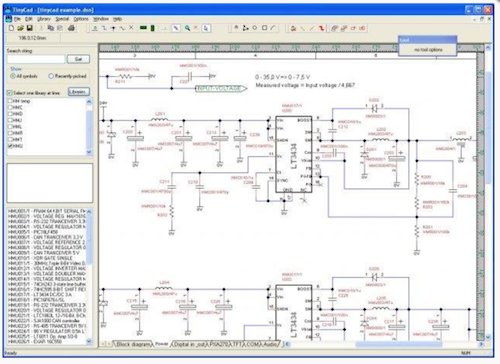 AutoTRAX DEX PCB is an integrated PCB design software and EDA for electronics engineers. Rapidly and easily move from design to production with this PCB design software tool that includes a hierarchical project manager. 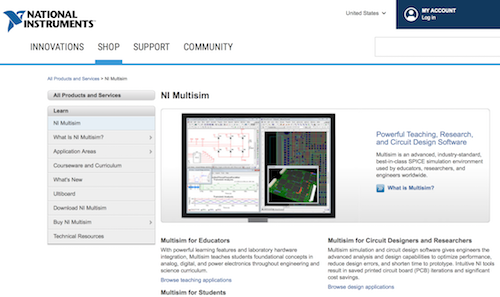 From National Instruments, NI Multisim is powerful circuit design software that is an advanced, industry-standard, best-in-class SPICE simulation environment used by electronics engineers around the globe. Multisim also is appropriate for educators and students. Zuken provides software solutions for PCB design, designing electrical wiring from schematic to cable harness and panel layout, and e-PLM. Electronics engineers choose Zuken CR-8000 when they require advanced PCB design software with a product-centric 3D PCB design platform. Bay Area Circuits is a PCB manufacturer specializing in quick-turn prototyping for businesses, designers, makers, and hobbyists. 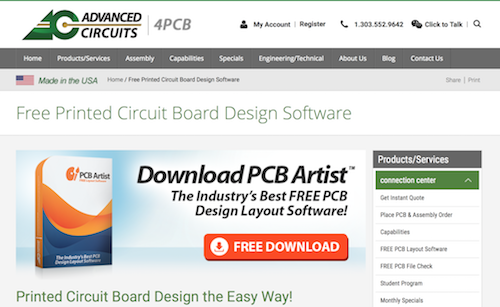 Their PCB Creator is a free PCB layout and schematic capture software that is the perfect solution for electronics engineers who want a powerful design tool without spending a lot of money. 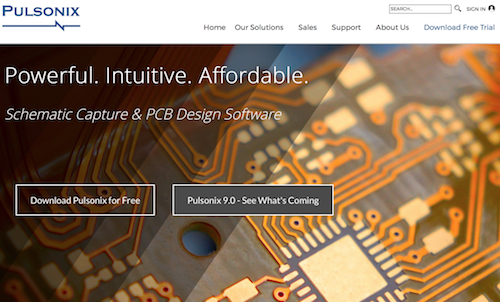 Pulsonix PCB is a global EDA company specializing in schematic capture and PCB design software. Electronics engineers improve their electronic design process with Pulsonix’s advanced, yet affordable PCB design software tool. 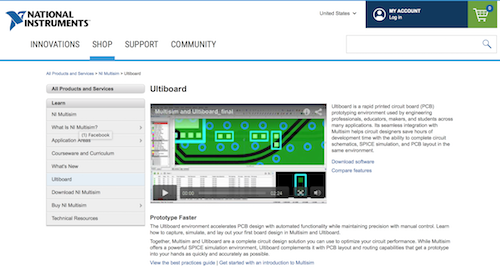 From Mentor Graphics, PADS PCB Design Software is a powerful PCB tool for electronics engineers that allows for the easy design of printed circuit boards. PADS allows for robust rules hierarchy, powerful interactive routings nd advanced features like physical design reuse. A leading global EDA and semiEDA company, Cadence enables electronic design innovation and plays an essential role in the creation of ICs and electronics. Electronics engineers turn to Cadence’s Allegro PCB Designer when they require a more predictable, shorter design cycle. 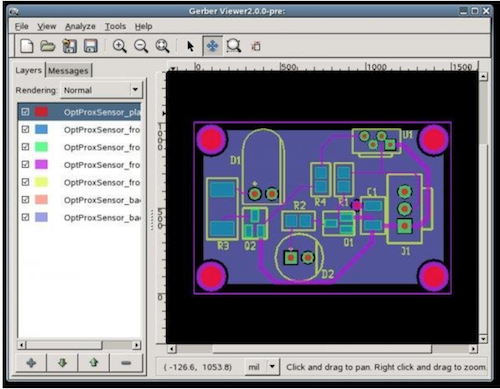 An EDA software package or automated design of electronic products, EDWinXP is the PCB designing and SPICE-based software tool from Visionics. An integrated PCB design software tool for electronics engineers, EDWinXP covers every stage of the design process, from schematic capture to PCB manufacturing and testing. 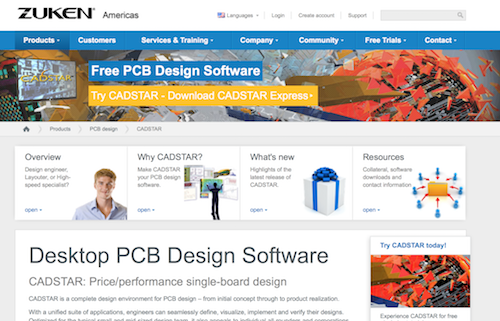 Zuken’s software solutions for electronics engineers include CADSTAR, a desktop PCB design software. This complete design environment takes engineers from their initial ideas through product creation, thanks to its unified suite of applications. 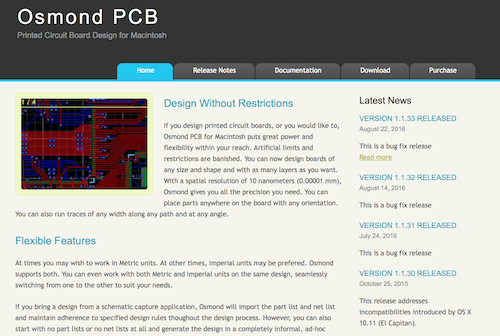 Osmond PCB is a PCB design software tool for electronics engineers using Macs. This PCB design tool gives users power and flexibility and eliminates artificial limits and restrictions to enable the design of boards of any size and shape and with as many layers as needed. Intercept Technology, Inc. is a leading supplier of technology-independent PCB, hybrid, and RF design and layout software. Their Pantheon PCB Layout Software is an ideal PCB design software tool for electronics engineers because it offers an easy-to-use interface with basic to advanced design options for increased productivity and efficiency. CometCAD is a schematic capture and PCB layout editor tool that is designed for electronics engineers using Windows. The PCB layout editor enables users to create rectangular multi-PCB panels and utilize PCB borders with polygon shapes. 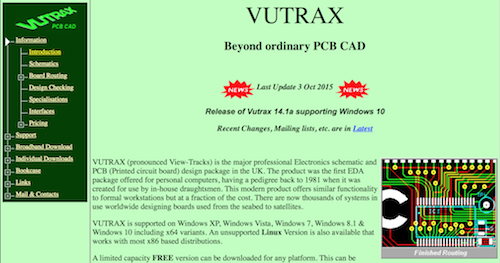 VUTRAAX is a major professional electronics schematic and PCB design package from the UK. VUTRAX is supported on Windows, and an unsupported Linux version is available to work with most x86 based distributions. Electronics engineers choose VUTRAX because it is scalable, features integrated schematic capture, and offers true WYSIWYG operation throughout. A premier electrical engineering community for hardware designers, EEWeb offers Microstrip Impedance. 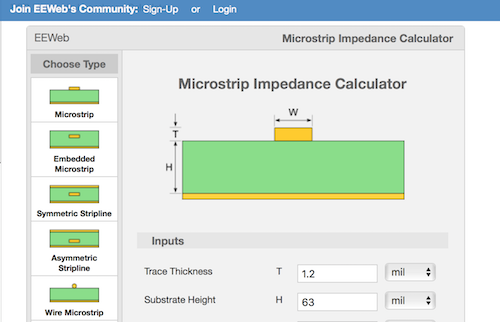 This handy PCB design tool does not require any installation or downloads, as it is a web-based PCB microstrip impedance calculator. Simple and useful, this PCB design tool is one electronics engineers should bookmark to use for their next design. 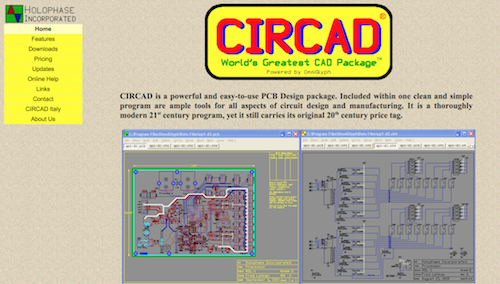 A powerful, yet easy-to-use PCB design package, CIRCAD includes all of the tools for circuit design and manufacturing that modern electronics engineers require. CIRCAD includes schematic capture, netlist generation, PCB layout, copper pour, design rule checking, several manufacturing output formats, and standard component libraries. 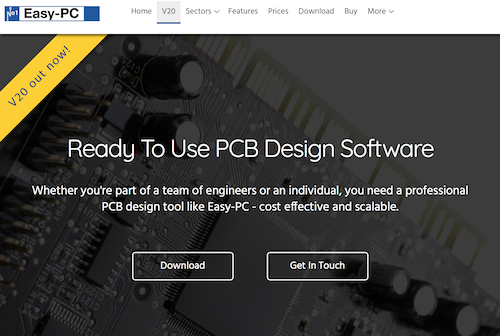 Eurocircuits is an online PCB prototype and small series specialists working to help cut designers’ and engineers’ time to market with fast and easy PCB procurement. Their online PCB data verification tools give electronics engineers additional piece of mind by enabling them to verify PCB data prior to placing orders.